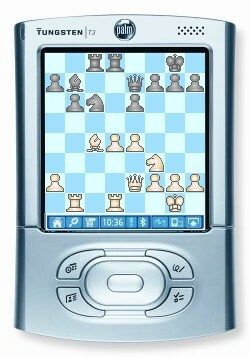 Chess Tiger for Palm is the strongest chess program for the PalmOS organizers, computers and phones (formerly known as PalmPilot or Pilot from 3com or PDA). Chess Tiger is originally an extremely strong program for the PC platform. It is currently sold under licence by Schroeder BV (Schröder BV, the makers of Rebel and Rebel-Tiger), Lokasoft, ChessBase (the makers of Fritz and Shredder) and Convekta (maker of Chess Assistant). Before Chess Tiger, there were only 2 chess programs for the Palm computers: ChessGenius and PocketChess. Chess Genius was the strongest, but now ChessTiger is even stronger! Does it mean that it is the best? It's up to you to decide. Just download the strongest palm chess software for free and evaluate its possibilities. Is Chess Tiger for the Palm a chessmaster? Just check it out with this free download evaluation version. Then you can feel what Kasparov felt in front of Deep Blue!! !